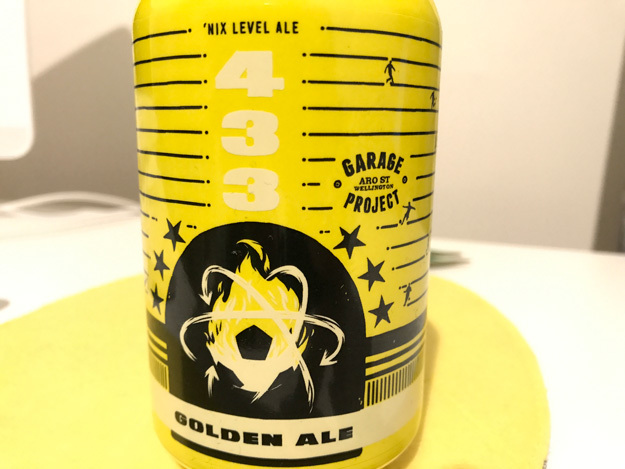 Garage Project’s 433 is a beer inspired by the Wellington Phoenix, a largely mediocre football team that (at the time of writing) has just finished a disappointing seventh out of the 10 teams in the trans-Tasman A-League competition. Here’s hoping this beer is better than the team that inspired it. Blurb on the can: Wellington is wonderful. We’ve got the wind, the rain and the Phoenix. And now 433, a super drinkable golden ale inspired by our local brand of the beautiful game. It’s a nimble combination with pilsner, Munich and wheat malts at the back and an attacking triangle of local star Southern Cross, kohatu and motueka up front. “Super drinkable” is something of an understatement. Everything about this beer screams total crowd pleaser, from its crisp, light body, to the clean flavour profile that boasts subtle hints of tropical fruit. I’ll bet it even pours a nice golden colour, but I can’t say that for sure as I’m drinking it from its yellow-and-black can. Word on the street is they serve Garage Project beer at Wellington Phoenix matches. Lucky bastards – I’d be happy if they just served drinkable beer at Super Rugby and cricket matches at Eden Park, let alone craft beer. The verdict: Unlike the football team that inspires it, 433 is a winner. Beer/movie combination: In terms of cinema, the best thing to come out of Wellington, of course, is Sir Peter Jackson, director of King Kong and The Lord of the Rings movies. I seem to remember recommending you watch the latter trilogy with another beer, so instead I’ll pitch awesome 1992 cult-zombie-splatter flick Braindead (aka Dead Alive in the US) as the movie to pair with this beer.